A solid contender but is let down by only having access to cPanel for higher end accounts and its lack of discount for lengthier contracts. Domain.com has been around since 2002. The company is located in Vancouver Washington and recently became part of the Endurance Group which include brands such as HostGator and Bluehost. Domian.com offers a variety of services such as VPS hosting, Shared Hosting, WordPress Hosting, SiteLock Security, Domain Privacy and a Website Builder amongst others. Domain.com also offers both Linux and Windows servers. The website itself is easy to navigate and products are laid out in a fairly comprehensible way. However, as we have seen before, the pricing is not as transparent as we would like but unlike other hosting providers this was noticed before getting to the ‘Checkout’ page. This makes Domain.com more transparent than some of its nearest competitors such as Bluehost. Prices are advertised as being as low as ‘$3.75 per month’ but when we looked further, we found this was only the case if we signed up to a 24-month plan. This worked out as a $90 upfront purchase. We also noticed the monthly price of $3.75 per month did not increase or decrease for the 12-month or the 36-month plans. This means that Domain.com do not offer discounts for the lengthier contracts, which is the custom with most hosting providers. The ‘Basic’ Plan, deemed the company’s most popular, starts at $3.75 per month when billed annually. You pay $45 upon checkout for the annual plan, $90 for 24-months and $135 for 36 months. This includes 1 website, unlimited disk space, scalable monthly bandwidth, 5 FTP users, 10 MySQL databases, unlimited subdomains, 1GB cloud storage and an SSL Certificate from ‘Let’s Encrypt’. The ‘Deluxe’ Package weighs in at $6.75 per month for a 12/24/36 month contract. It includes all the ‘Basic’ tier has to offer but also has unlimited websites, 25 FTP Users and 25 MySQL databases. The ‘Ultra’ package is offered at $13.75 per month for 12/24/36 month contracts. It has all the other two plans include but also unlimited FTP Users, unlimited MySQL databases and premium support. As Domain.com do not offer a discount when you commit to a longer plan, it is that bit pricier than some of its competitors. On a plus note, Domain.com do seem to be very activate on both their Facebook and Twitter accounts. A message sent via their Facebook page prompted an auto response informing us of all the other ways we could get in contact with the company and that they would be in ‘touch soon’. Domain.com has an option to ‘Compare’ all plans, making it much simpler to see what we were getting from each plan. After deciding on our preferred plan, we clicked on ‘Buy Now’ and moved on to getting our account setup. The initial step asks you to pick a Domain name. None of these are included in the price and start off at $5.99. Also, be aware that ‘Add Domain Privacy’ is checked by default with another $8.99 automatically added to your cart. The next page list extra products you can purchase. It was good to see that none of these had already been checked and added to our basket, leaving us to freely choose any extras we liked without being tricked into purchasing. Each plan comes with a Website Builder and you can use it to build 6 pages. If you need more than that you can purchase the professional Website Builder for a further $131.88 during checkout or at a later stage. Step 3 was where we had to put in all our details. We found that the company tried to increase our domain name contract from 1 year to 2 years which was going to cost us double. This is in spite of being quoted for only 1 year at the beginning of this process. However, after that it was plain sailing and we filled in our details. We were able to choose between paying by PayPal or Credit Card. Domain.com do include some security measures and your purchase may be suspended while being reviewed by their order verification team. While this does not take long, it is inconvenient especially if you want to get started on your website immediately. All plans are automatically renewed unless you cancel. You can do this either by phone, live chat or by logging into your account. Before we could begin using our account we were asked to ‘Set a Security Question’. Once this was answered, we were brought straight to the Dashboard and the fun could begin. Unless you committed to the top VPS tier, you will not be able to access cPanel. However, you will be able to use Domain.com’s customized vDeck Control Panel, which does have everything you need to create a website. It was disappointing to discover that cPanel is not available with every plan. From the Dashboard we were able to access more advanced tools and get started on creating our website. Each tool is clearly laid out and include FTP, FileManager, EWICD online store, MySQL database, visitor statistics, Archive Gateway and much more. Domain.com includes the Weebly Website Builder and with this you can create up to 6 webpages. This is fairly basic so, as previously mentioned, feel free to purchase the professional Website Builder if you need more. Weebly is a fantastic drag and drop tool which makes website creation seamless. You can easily integrate photos, videos, contact forms and blogs. Your account comes with access to the Mojo Marketplace where you can get a variety of extra themes, plugins and services. More experienced users can go straight to FTP, .HTACCESS editor, CGI and Scripted language support. Everything is found under ‘Advanced Tools’ and it won’t be long until you are up and running. Support is one of the key ingredients when it comes to hosting packages and Domain.com does not disappoint. The live chat is available 24/7/365 and it was perfectly easy to connect to an agent. 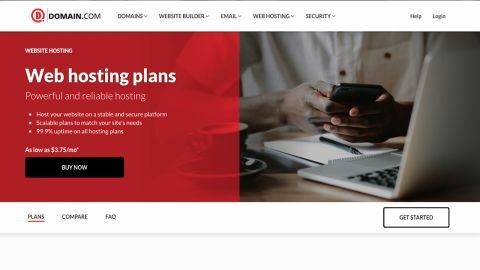 We posed the question ‘Is the Website Builder included in the hosting plans or does it have to be purchased as an extra?’ via Chat Support and an agent was with us in less than 30 seconds. The agent was very friendly and helpful who patiently explained our initial query and additional questions we posed. The Knowledgebase is divided into several categories such as account, advanced hosting, domains, email and security amongst others. Articles are easily identifiable and can be found through a simple search. When we typed in ‘Transfer Domain’ we were met with articles like ‘Domain Transfer: How to transfer a domain to your Account?’, ‘How to Transfer your domain to another Company’ and ‘How to Transfer multiple domains to your account?’. You can access all articles whether you are a customer or not. Domain.com offers a 30-day money back guarantee and this can be done by phone or through chat support. We decided to leave the support agents alone and ran one final Bitcatcha test. As the server is located in the US, speed times were very fast from both the eastern and Western USA. There was a slight time lag when it came to the UK but overall it performed very well. Domain.com has a lot to like about it with an array of feature which would suit the most discerning of users. However, it’s lack of monthly price plans and discounts for making a longer commitment to the service is disappointing.